Felix Hernandez tied Hall of Famer Randy Johnson for the most strikeouts by a Mariners pitcher and Leonys Martin homered, helping to lead Seattle to a 3-2 victory over the Yankees on Saturday at Yankee Stadium. Hernandez issued six walks over five innings, but was able to navigate through the Yankees' lineup -- permitting just one run and five hits. The Yankees went 0-for-12 with runners in scoring position and have managed just three hits in their last 46 such at-bats (.065). 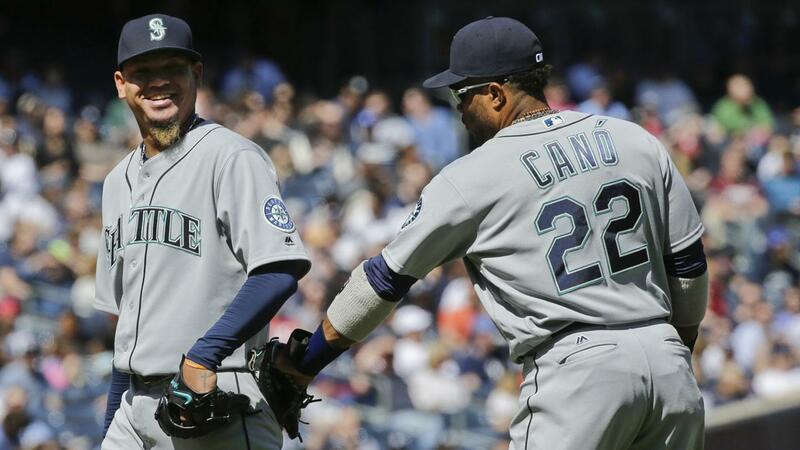 "He didn't make it look easy today," Mariners manager Scott Servais said, after Hernandez notched his first win of the season. "It's a tough lineup. They're going to work him and make him throw strikes. Obviously, he didn't have his best command today. But Felix doesn't give in. He kept battling and made pitches when he had to." Martin's second homer of the season tied the game in the fifth off CC Sabathia, part of a three-run inning that saw Robinson Cano drive home Ketel Marte with a go-ahead single and Nelson Cruz contribute an RBI double. Sabathia lasted 4 2/3 innings and was tagged with the loss in a matchup of former Cy Young Award winners. "I think it's just early in the season," Sabathia said. "We've got a good enough pitching staff in here that we can make some adjustments and get some outs the third time through. It's just a matter of staying healthy and getting on a good roll." Carlos Beltran hit a seventh-inning homer, his third of the year, off Nick Vincent. Steve Cishek pitched a scoreless ninth for his first save. The Yankees have lost four straight games, while Seattle won its third in a row to improve to 5-6. Lumber and legs: The Mariners finally got to Sabathia in the fifth with a leadoff homer by Martin that was projected at 413 feet by Statcast™. Seattle then used some speed from shortstop Marte to take a 2-1 lead, as the 22-year-old scored from first on a Cano single to center fielder Jacoby Ellsbury. Marte was running on the 2-2 pitch and never slowed, as third-base coach Manny Acta waved him home ahead of the relay throw. When Cruz followed with an RBI double, Sabathia's day was done. Not so crisp with RISP: The Yankees' issues with runners in scoring position saw no relief on Saturday; New York's lone run off Hernandez came in the third inning as Mark Teixeirascored all the way from first base on Beltran's double to center field. Alex Rodriguez couldn't help the cause; he went hitless in five at-bats and heard boos following his ninth-inning strikeout, extending his skid to 0-for-19. Big K ties Big Unit: Hernandez struggled with his control in tying his career high with six walks, but the King finished his day with a huge strikeout of Didi Gregorius to strand runners on the corners and preserve a 3-1 lead in the fifth. Hernandez's fourth whiff of the game pulled him into a tie with Johnson for the Mariners' all-time career strikeout record at 2,162. Last call: The Yanks had a two-out rally cooking in the ninth, as Beltran stroked his fourth hit of the afternoon before leaving for pinch-runner Aaron Hicks, who raced to third base on aStarlin Castro single. Castro stole second with Chase Headley at the plate, putting the winning run a hit away. But Cishek got Headley to ground to Cano at second base for the afternoon's final out. "It's fun, but it's tiring, too." -- Marte, on scoring from first on Cano's single to center. Hernandez's ERA now stands at 1.41 after nine career starts against the Bombers at new Yankee Stadium (10 runs in 63 2/3 innings). That's the best ERA of any pitcher in stadium history with at least 50 innings. Mariano Rivera is second on that list at 1.92. Mariners: Right-hander Hisashi Iwakuma (0-1, 4.09 ERA) makes his third start of the season in Sunday's 10:05 a.m. PT series finale at Yankee Stadium. Iwakuma is 2-2 with a 3.30 ERA in five games against the Yankees and is making his first start against Masahiro Tanaka, his former teammate with the Rakuten Golden Eagles in Japan's Pacific League. Yankees: Masahiro Tanaka (0-0, 3.38 ERA) will get the ball for the 1:05 p.m. ET finale. He and Iwakuma were a combined 120-62 over their five years together in Japan from 2007-12, and Tanaka said that he looked up to Iwakuma, the ace of the staff when he arrived. Tanaka is looking for his first win of the season after taking a pair of no-decisions. He is 3-0 with a 2.35 ERA in three career starts vs. Seattle.